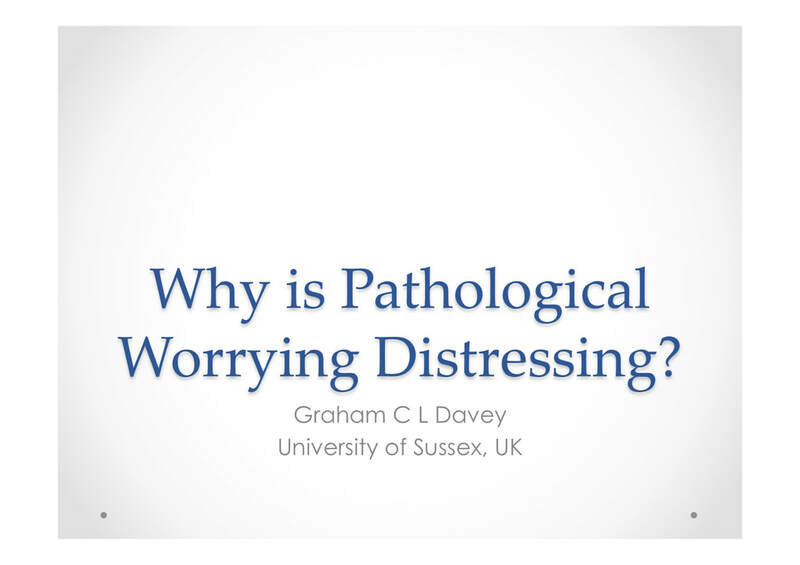 Why is Pathological Worrying Distressing? Distress is a defining feature of most mental health problems, but there are relatively few psychopathology models that focus directly on distress and attempt to identify the specific factors that generate that distress. This paper will discuss how experimental psychopathology research contributes to improving our understanding of what causes distress during pathological worrying and makes it qualitatively different to adaptive, everyday worrying. These factors include the automaticity of cognitive processes involved in worrying, negative thought intrusions, endemic negative mood during worrying, and the role of conflicting beliefs about worrying. This paper outlines a putative pathway for experimental psychopathology research developing psychological models of OCD. The pathway uses established external validity criteria to define the pathway and clarifies the important role that research conducted on healthy participants can play in our understanding of OCD. Defining a research pathway for experimental OCD research in this way has a number of benefits. It would (1) make explicit the need to address the external validity of developed models, (2) provide a clear programme of research that would be required to extend research on healthy individuals to populations with a diagnosis of OCD, and (3) recommend a closer reciprocal relationship between psychological models of OCD and existing core psychological knowledge. A structured research pathway for psychological models would help to provide a more robust (and fundable) alternative to other more medically-oriented paradigms such as neuroscience and genetics. 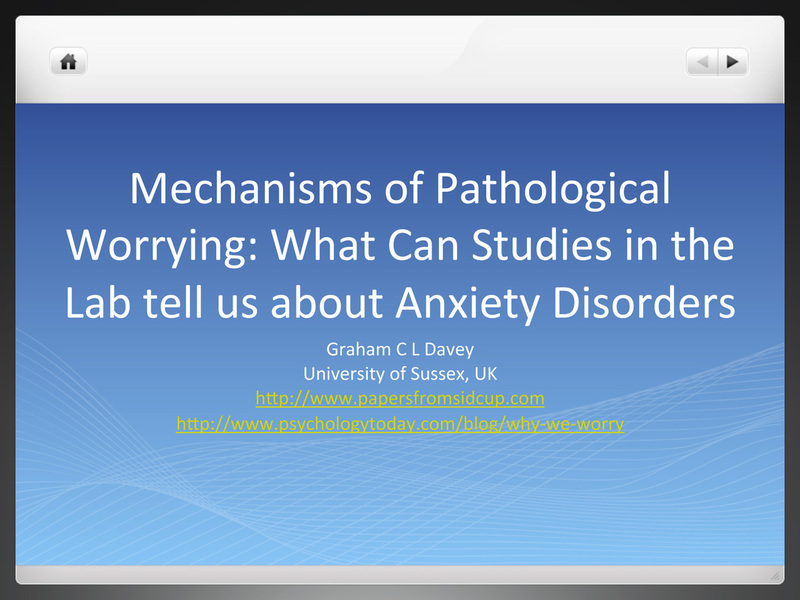 Mechanisms of Pathological Worry: What can Studies in the Lab tell us about Anxiety Disorders? Experimental psychopathology is the use of experimental methods to study the psychological processes that either contribute to mental health problems or help to alleviate symptoms of mental health problems. In this paper I will outline reasons why experimental psychopathology is a necessary component of clinical psychology research, and describe some of the theoretical benefits of experimental psychopathology methods – especially in relation to the understanding of anxiety disorders. I will also argue that experimental psychopathology is an approach that is significantly under-used by clinical psychology researchers, and that clinical psychology research runs the risk of becoming insular and self-perpetuating if it fails to embrace experimental psychopathology. Experimental psychopathology is the use of experimental methods to study the psychological processes that either contribute to mental health problems or help to alleviate symptoms of mental health problems. In this paper I will outline reasons why experimental psychopathology is a necessary component of clinical psychology research, some of the theoretical benefits of experimental psychopathology methods, how it is an approach that is significantly under-used by clinical psychology researchers, and how clinical psychology research runs the risk of becoming insular and self-perpetuating if it fails to embrace experimental psychopathology. 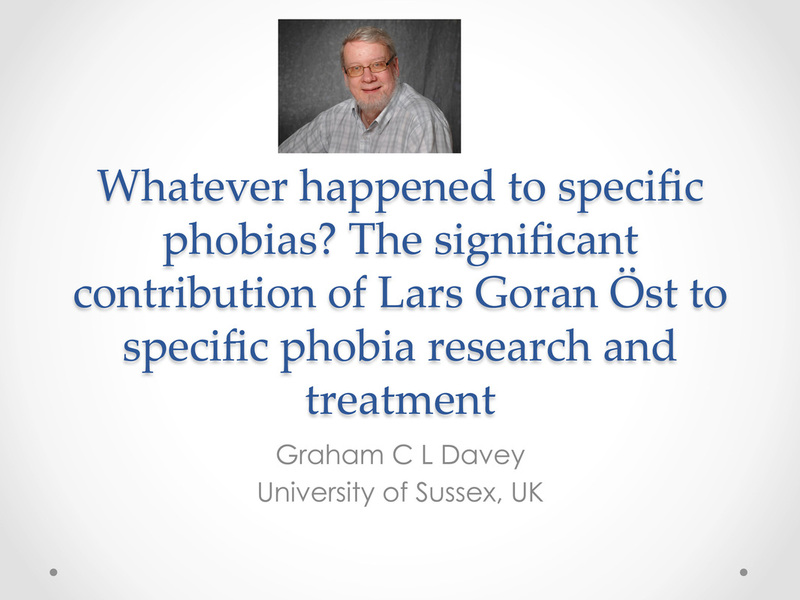 This paper will review the contribution of Lars Goran Öst to specific phobia research and treatment. The story begins in 1978 and covers all variety of specific phobias, including spiders, snakes, thunder, lightning, blood and dental phobia, claustrophobia, and flying phobia. His early contribution to aetiology was to highlight the various ways in which specific phobias could be acquired. His 1981 paper on this with Kenneth Hugdahl was one I carried around with me for some time, and had a significant impact on my own conceptualization of how phobias were acquired. More recently Lars Goran’s contribution has been to refine and evaluate brief exposure treatments for a range of phobic disabilities, and these will be briefly reviewed. I will end by asking why specific phobia research seems to have had a very low profile over the past 10 years – has Lars Goran Öst given us all the answers? Three constructs considered to be important primary beliefs in the pathogenesis of OCD are inflated responsibility, intolerance of uncertainty and thought-action fusion. While there is evidence suggesting that these beliefs/appraisals can influence OCD symptoms, we conducted two experiments to determine whether manipulating aversive intrusive thoughts would conversely affect measures of these constructs. Using procedures in which nonclinical samples were asked to mentally rehearse either OCD-relevant aversive statements or neutral statements, Experiment 1 found that participants rehearsing aversive statements generated higher scores on measures of responsibility and thought-action fusion than a control condition. Experiment 2 found that rehearsing aversive statements facilitated measures of responsibility, intolerance of uncertainty and thought-action fusion, but only when rehearsal was self-referent. Rehearsing aversive statements significantly increased measures of negative mood, and mediational analyses suggested that the present findings could be explained either by increases in some measures of negative mood mediating the observed increases in appraisal ratings or alternatively, increases in some appraisal ratings increasing negative mood. These findings indicate that experiencing frequent, uncontrollable aversive intrusive thoughts of an egodystonic nature may activate OCD-relevant appraisal processes representing causal factors for symptoms, and directly tackling these thoughts in psychological interventions may be sufficient to alleviate anxiety symptoms. Worrying, Checking and Depressive Rumination are all open-ended activities that appear to be controlled by implicit stop rules deployed by the individual. When worrying, checking and depressive rumination become pathological, the stop rules used are derived from metacognitive beliefs that the individual has developed about the usefulness of these activities. I will describe some studies across all of these psychopathologies that show how stop rules are linked to metacognitive beliefs and how these stop rules interact with current mood to determine perseveration and make the experiences of worrying, checking and ruminating seem uncontrollable. 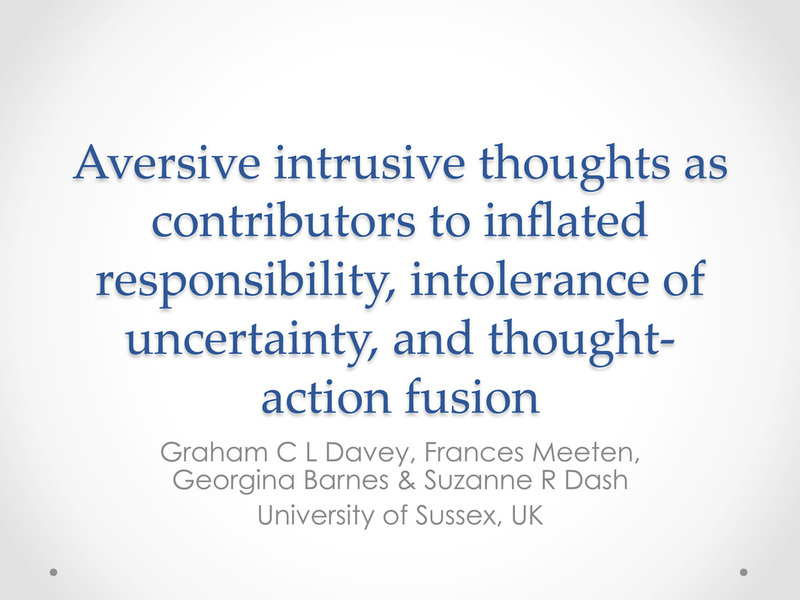 Paper presented to the Mood & Anxiety Research in Sussex Group (MARS), Brighton, May 2012. This paper argues that anxiety is a motivational system that is represented and stored as an emotional schema that coordinates psychological and biological responses to anticipated threat. This anxiety schema is built out of the largely hardwired fear system but also recruits a range of other basic psychological operations that influence orientation, attention, engagement and disengagement, threat avoidance, and cautious defensive interpretations of sensory input. Conceiving of anxiety as an acquired schema has a number of implications for our understanding of how anxiety disorders develop out of a fundamentally adaptive system. 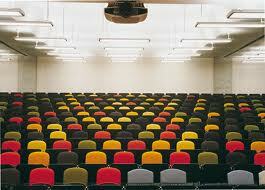 In particular, emotional schemas are activated automatically and without the need for effortful processing. Consequently, top-down attentional processes are needed to modulate schema activation and to influence its behavioural expression. However, when controlled attentional resources are poor or working memory capacity is low, controlling schema activation is difficult and anxiety will feel less flexible, less controllable and more distressing. Paper presented to the Annual Conference of the BABCP, Guildford, July 2011. This paper discusses some of the reasons why clinical populations may be particularly vulnerable to mood-as-input processes that will generate perseverative worrying. In particular, mood is more likely to be used as information if the individual is in a negative mood, if the individual is unable to use more concrete or objective evidence to make decisions (e.g. because of poor problem-solving confidence or abilities), and if the individual deploys an information processing strategy that inflicts a high cognitive load (e.g. deploys systematic or deliberative processing during negative mood). These are all important characteristics of pathological worriers. Similarly, it appears to be core negatively valenced affect that provides the informational content in mood-as-input effects and so will contribute to the transdiagnostic nature of worrying Negative affect is also likely to lead to the deployment of stricter ‘as many as can’ stop rules for the task at hand and combine with negative mood to provide a configuration conducive to perseveration. The bidirectionality hypothesis: Are clinical constructs both causes and effects of symptoms? One way of testing the explanatory value of clinical constructs is to manipulate these variables under controlled experimental conditions and observe their effect on measures of symptoms. Most of the published research that has adopted this method has provided support for the clinical construct as a cause of symptoms and consequentially has supported the use of that construct as part of an explanation of the psychopathology. However, very few studies have been conducted to investigate the opposite causal pathway – whether experimentally manipulating symptoms causes changes in measures of the clinical construct. If such causal bidirectionality does exist, then this calls into question the explanatory value of the construct as a causal factor in the acquisition and maintenance of symptoms. We describe a series of experiments that have manipulated mood valency and clinical constructs related to OCD. The results suggest that experimental manipulation of clinical constructs such as inflated responsibility and intolerance of uncertainty cause increases in measures of negative mood (such as anxiety), and that manipulation of negative mood caused increases in measures of both inflated responsibility and intolerance of uncertainty. The implications of this bidirectionality for explanations of psychopathology symptoms are discussed. Mood-as-input hypothesis is a theory of task perseveration that has been applied to perseverative pathological worrying. I will review 10 years of published evidence from laboratory-based analogue studies and describe their relevance for worry perseveration in clinical populations. In particular, mood-as-input hypothesis predicts that worry perseveration will be influenced by interactions between the individual’s stop rules for the task and their concurrent mood, and that the valency of an individual’s concurrent mood is used as information about whether the stop rule-defined goals for the task have been met. The majority of the published research is consistent with this hypothesis, and I will provide evidence that clinical populations possess characteristics that would facilitate perseveration through mood-as-input processes. I will argue that mood-as-input research on clinical populations is long overdue because (1) it has potential as a transdiagnostic mechanism helping to explain the development of perseveration and its comorbidity across a range of different psychopathologies, and (2) it has treatment implications for dealing with clinical perseveration such as perseverative worrying. Both checking and worrying are open-ended tasks and this is no more apparent than in disorders such as OCD and GAD when these activities become perseverative and form cardinal features of the diagnostic criteria. However, research over the past 10 years has highlighted the fact that individuals engaging in checking and worrying do deploy implicit stop rules for these activities, and the kinds of stop rules they deploy will influence their perseveration at the task. This paper reviews research on stop rules for checking and worrying, describes the different types of stop rules that individuals with anxiety-based disorders may deploy, explains how these stop rules may interact with the individuals current mood to generate perseveration at the activity, discusses the factors that influence the type of stop rule deployed, and examines how stop rule use can become linked to metacognitive beliefs. Revitalizing mood-as-input research: Where is the theory and what are the real applications? Paper presented to the Maastricht mood-as-input symposium, Maastricht, November 2009. This paper aims to provide an overview of the role of mood-as-input hypothesis in experimental psychopathology, and to indicate some of the critical issues that need to be addressed in this area. The paper will begin by discussing some of our applications of mood-as-input theory to a range of perseverative psychopathologies, including worrying, checking, rumination, dieting and gambling. The second part of the paper discusses some critical issues, including the independence of stop rules and mood and the robustness of mood-as-input effects. The third part of the paper discusses whether mood-as-input effects are actually caused by a mood-as-input mechanism, and what evidence we would require to show this. The final part of the paper discusses some applications of mood-as-input hypothesis to the treatment and support of individuals with worry-based psychopathologies. Paper presented to the Annual Conference of the BABCP, Exeter, July 2009. Inflated responsibility, intolerance of uncertainty, “not just right experiences”, elevated evidence requirements, deployment of “as many as can” stop rules, and negative mood are all factors that have been implicated as potential causes of compulsions. We used structural equation modelling to draw up a preliminary representation of the relationships between these variables, and then experimentally tested some of these relationships. In the first experimental study we subjected participants to either a positive or negative mood manipulation and assessed the effects of this on measures of the remaining constructs. The results indicated that participants undergoing the negative mood induction scored significantly higher than participants in the positive mood induction on measures of inflated responsibility, the deployment of ‘as many as can’ stop rules, and intolerance of uncertainty. Participants in the positive mood induction scored higher than those in the negative mood condition on measures of the deployment of ‘feel like continuing’ stop rules. These findings represent a first step in understanding how those various constructs that have been implicated as causes of compulsions may interact.